I don’t think that many academics do a good job in communicating their findings to a broader public. When we apply for grants or research funds, we are often asked to discuss how we would disseminate our findings. A SSHRCC funding officer once said to me that academics don’t give this much attention. It’s such an afterthought that some even suggest that they will ‘write an op-ed’ or pen a New Yorker article. The paucity of political scientists in these two venues suggest that we don’t really do that. To be sure, there are some who are very public in making their scholarship accessible to a wider audience. But not many. 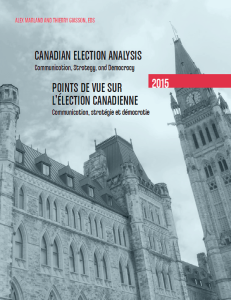 So, when I was approached by the editors Alex Marland and Thierry Giasson to contribute to a novel project whose goal was to get political scientists to react quickly to the election in a format that was accessible to a wide audience I enthusiastically agreed. If you click the image above you can see the list of contributors and download the e-book for free. 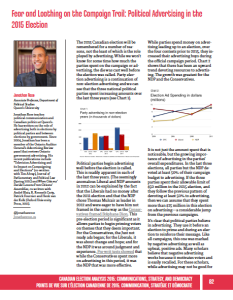 My own contribution to the Marland & Giasson collection is on political advertising in the 2015 Canadian election. Clicking on the image to the left will open up the article. One of the challenges of this project is to write before having all the information at your disposal since we were asked to produce our articles merely days after the election. I’m looking forward to reading my colleagues initial thoughts. Whatever the outcome, I hope that these kinds of publishing endeavours where academics are able to provide initial insight for a wider audience will continue. It represents the best kind of popular dissemination and something that we should do more frequently.